Carve Me A Bear! Chainsaw Carvings specializes in the carving of wood with a chainsaw. These custom, one of a kind creations make great birthday, anniversary, Christmas, wedding, house warming and anytime gifts. Please feel free to browse around our website to find out a little more about the artist, Lewis Clark AKA Clark The Carver and see some examples of his work. Clark has been chainsaw carving statues, sculptures and signs for sale for over 30 years and has won numerous awards and accolades! 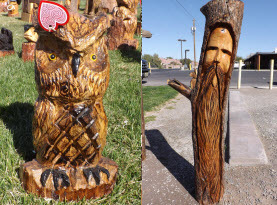 Chainsaw Carvings of Bears, Dogs, Birds, Mascots, Tiki’s/Totem Poles, Furniture & Much More! 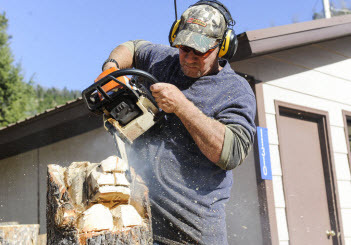 Clark can carve practically anything out of pine, redwood, ponderosa, cottonwood and other quality wood using a chainsaw. 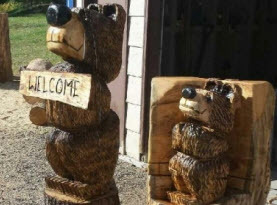 Some of his more popular requests include chainsaw carvings of bears, dogs, birds, horses, moose, mascots, Owls, Coyote, Wolves, Bunnies, Squirrels, Lions, Chickens, Pigs, eagles, garden wizards, Mountain Men, raccoons, Cowboys, Indians, tiki’s/totem poles, custom furniture such as benches and tables, custom order signs, mantels, flower pots & memorial planters & much more! 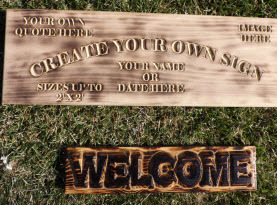 Call or email today to get a quote, we take custom orders for all sizes of carvings of any kind. Let us know what you have in mind, and we can get you a quote for the carving of your dreams! Clark can make any of the chainsaw carvings you see on this website in any size you wish. (Most of the pieces shown are not in inventory, rather they are created when you order). We take custom orders for wood chainsaw carvings of any kind. If you have something special in mind, please feel free to call or fill out the contact form on the website and we can give you a quote. Although Clark uses many other types of wood, currently most of his chainsaw carvings & sculptures are carved from pine due to it’s availability in the area. Pine wood is easy to cut and makes practical lightweight furniture and décor. Other preferred woods are redwood, ponderosa and cottonwood. These woods are known for soft and straight fibers. They are easy to carve and not as prone to cracking as other wood types. However, if you prefer another wood, be sure to let us know and we can try to accommodate any request. Each chainsaw carving is a one of a kind and holds its own special characteristics. Clark applies different mixed paints to his chainsaw carvings to best recreate the beautiful colors of nature. He also puts a relief cut in most chainsaw carvings to allow the wood to expand and contract with the changing weather. We apply quality wood varnish and clear coat to preserve, seal and enhance the natural rich colors that the wood has to offer. Tree Stump Removal can be very difficult & costly, and many people have an attachment to an old tree they have had for years. 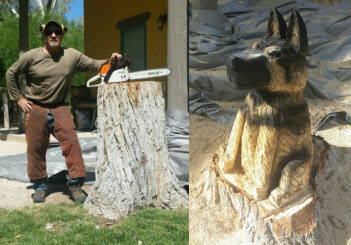 Why not have a custom Chainsaw Carving done instead of cutting down the old dead or dying tree & Grinding the stump. Clark can give you a quote for a custom carving sculpture that will add beauty & value to your home and allow you to keep the spirit of the old tree around forever! Clark has also done many beautiful Tiki Carvings using Palm Tree Stumps. If you have a palm tree stump in need of removal, call today to see what Lewis can do to turn that eye sore into a beautiful work of art. Carve Me A Bear! Chainsaw Carvings exclusively uses reclaimed wood from tree service companies or harvests the wood used in our carvings from naturally downed wood from trees fallen in high winds, floods, etc. If you can dream it, Clark can carve it. Call today for a free consultation & quote to add that special touch your property needs. Remember to check back often, we will be adding new chainsaw carvings all the time! 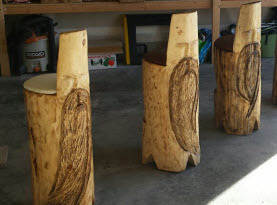 Chainsaw Carved Bears, Dogs, Birds, Horses, Mascots, Owls, Coyote, Wolves, Bunnies, Squirrels, Lions, Chickens, Pigs, Eagles, Garden Wizards, Mountain Men, Raccoon, Cowboys, Indians, Tiki’s/totem poles, Custom Furniture, Benches, Tables, Custom Signs, Mantels, Flower Pots, Memorial Planters & Much More!